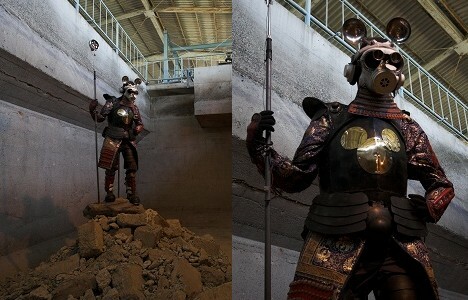 Mickey the Knight, a sculptural work by visionary neo-pop artist Yanobe Kenji, is a mouse-eared, gas-masked, fully-armored warrior who looks like a mutant samurai member of the Mickey Mouse Club. According to Yanobe's notes, which were on display along with Mickey the Knight at a recent Yokosuka Museum of Art exhibit, he was invited to submit a Disney-themed piece for Disneyland's giant 50th anniversary celebration held in 2005. Known for work that explores issues like how to survive and have fun in post-apocalyptic settings, Yanobe drew inspiration from the legendary Mickey Mouse Gas Mask, an intriguing historical artifact whose background story reflects some of the themes found in Yanobe's work. The Mickey Mouse Gas Mask was manufactured in 1942, at a time when segments of the American population, particularly those in Hawaii, feared a potential gas attack by the Japanese. With the permission of Walt Disney himself, 1,000 of the masks were produced for the US Army, who distributed them to civilians in the hope that the friendly, toy-like design would encourage children to carry them around and wear them for longer periods of time should an actual attack ever occur, thus improving their chances for survival. Apparently, this concept inspired Yanobe to create Mickey the Knight. The Disney gas mask reminds me of a Terry Gilliam movie. 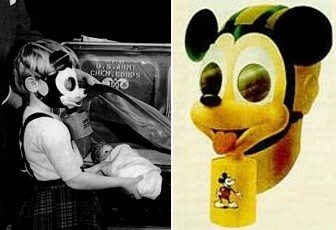 did the us army not think that the mickey mouse mask would inspire sadistic killers or bank robbers? to be honest, the mickey mask is quite intimidating and very scary. can you imagine someone with that mask, dungarees and an axe chasing you? NIGHTMARE!!!!!! ????? ???? - ???? ?, ?????????? ??????????? : ???????? ?